Congratulations to Dellin Betances and Mark Teixeira, who were chosen to represent the New York Yankees at the 2015 All Star Game. Alex Rodriguez was not selected but, unlike many other fans, that doesn't bother me at all. I suppose I should be happy he is on the ballot. However, it is very hard to be happy, because this guy always gets short shrift. In my opinion he's the best player no one has ever heard of. He has always been over-shadowed by the high-priced stars he plays with, and over-looked because of the bell-and-whistle-toting outfielders he competes against. I am absolutely outraged by this ballot. Why in the world is Mike Moustakas a candidate? Including pitchers, they already have six players on the AL roster. Six! This is total BS. You have until this Friday at 4pm to make your voice heard. 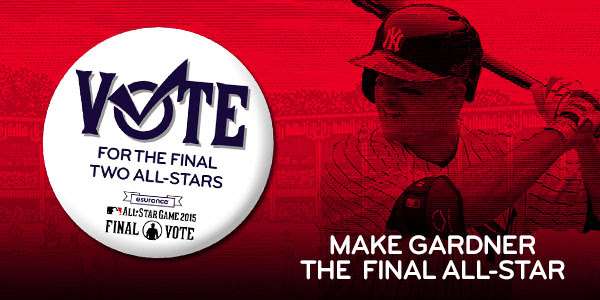 Also, from 10am to 4pm on Friday, each tweet that includes #VoteGardy counts as a vote. Remember, #VoteGardy doesn't count as a vote until Friday. You must go to the link above to cast your vote (early and often) until then!